He pricks a needle into a banana and this is what happens! Such an amazing trick! This trick with a needle is really very handy! Not only are bananas very tasty; they’re also incredibly healthy. Did you know that eating two bananas per day can do amazing things for your health, for example? Maybe you did, but we don’t think you ever thought of sticking a needle into a banana before. It sounds strange, but it’s actually very useful! You’re going to be using this trick a lot after seeing this video! We’d never expected that a needle could be so useful when it comes to peeling a piece of fruit. 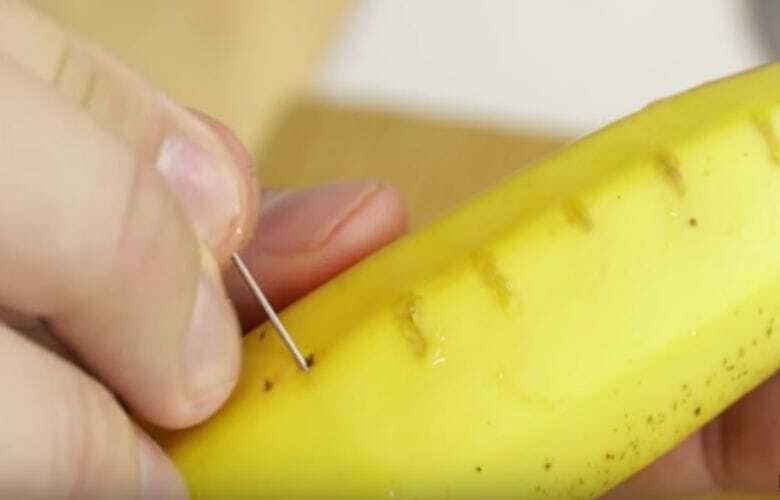 The man in the video on the next page stuck a needle into a banana and what happens is rather incredible. He begins at one end of the banana by pricking the needle in and then wiggling it from left to right, through the banana. Next, he moves the needle down a few centimetres and does the same thing again. He keeps doing this until he’s reached the other end of the banana. When the man in the video opens the banana after his needle trick, the entire piece of fruit turns out to have already been cut into slices! By using this handy trick, you can eat the banana immediately after taking off its peel. Besides giving us this handy trick, the man also has an additional fun tip to fool a friend. Do the needle trick without your friend being able to see what you’re doing. Then, let the friend take off the banana’s peel. The banana will come out already sliced and your friend will be stunned! They’ll probably think you did a magic trick! You can see the instruction for the trick with the needle in the video from 1:47 onwards. Watch the entire video for more fun food tricks! Go to the next page for some more amazing banana tricks!